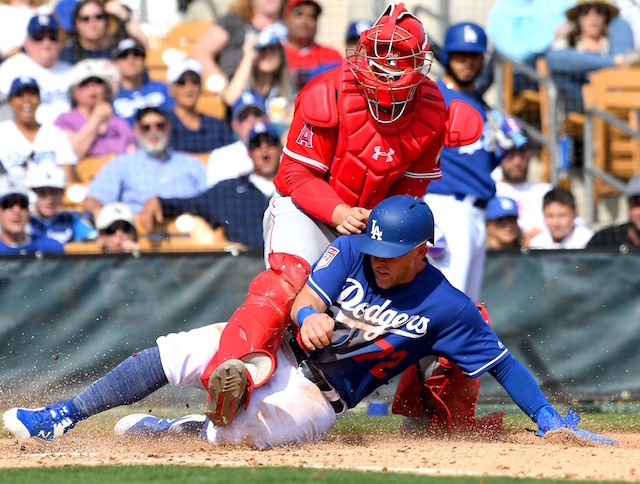 One day after chasing Chicago White Sox starter Donn Roach in the first inning of their Cactus League opener, the Los Angeles Dodgers did so again Sunday en route to a 13-9 win over a split-squad Los Angeles Angels of Anaheim team. Jesus Castillo began the game by retiring A.J. Pollock, only for matters to go downhill from there. He hit Max Muncy with a pitch, walked Chris Taylor and gave up an RBI single to Russell Martin. 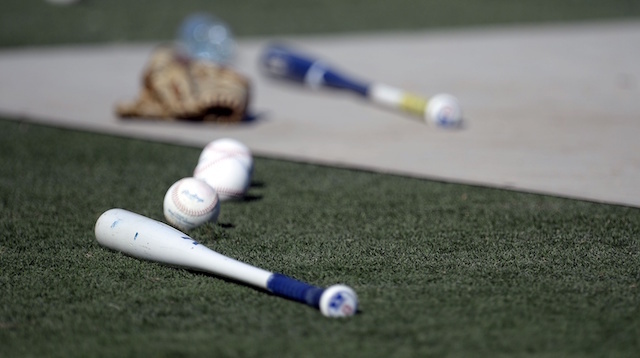 It marked a second consecutive day in which Martin drove in at least one run. Ezequiel Carrera’s base hit extended the Dodgers’ lead to 2-0, a passed ball brought in another, and Alex Verdugo’s sacrifice fly made it 4-0 and knocked Castillo out of the game. Chris Taylor’s ringing double drove in another run in the second inning, but the offense went largely quiet after that. And like against the White Sox, Dodgers pitching allowed their lead to be cut into. Hyun-Jin Ryu worked around Kole Calhoun’s leadoff single to toss a scoreless first inning. He completed his day’s work by throwing a second inning in the bullpen. Dennis Santana’s spring debut got off to a subpar start as he immediately faced runners at the corners with nobody out. He promptly struck out the next three batters to preserve a 4-0 lead. Joe Broussard didn’t fare nearly as lucky after walking Calhoun to start the third. Peter Bourjos’ double led to a run scoring on an RBI groundout. Broussard then walked consecutive batters and exited with the bases loaded. Parker Curry surrendered a bases-clearing triple to Matt Thaiss before getting out of the inning. Anaheim completed their comeback with a three-run fourth inning. They took a 7-6 lead when Jake Peter failed to come up with a routine grounder, allowing Keinner Pina to score from third base. Their lead was short-lived, however, as D.J. Peters tied the game in the fifth inning with his first home run of the spring. He then capped off back-to-back-to-back home runs in the seventh, giving the Dodgers a 10-7 lead. Omar Estevez and Matt Beaty were part of that stretch. The scoring outburst continued when Daniel Castro hit a two-run double, and on Josh Thole’s sacrifice fly.